The basic thesis of this document, is that the Internet and Globalization are not only not aspects of the same phenomenon, they are in fact part of opposing phenomena. They are aspects of two larger forces, which are currently engaged in a global struggle for dominance. One of these forces will be, if not eliminated, then at least changed in form in fundamental ways to make it more compatible to the other. To put it more bluntly, one of them will conquer and tame the other. Before I can be more specific about that, though, we need to talk a bit about networks. In particular, about connectionist networks. One example of a connectionist network is the brain (human or otherwise), but we'll try to look at the general characteristics, because neurons are not the only things making connectionist networks nowadays. WHERE IS THE INFORMATION IN A CONNECTIONIST NETWORK? The very nature of a network of connections (such as a network of neurons in the brain) is often difficult to understand, for a person not accustomed to thinking about them. Where, exactly, is the information being stored? Conditioned by analogy with card catalogs, libraries, file folders, or computer hard drives, we have a tendency to look at the node to see how the information is stored there. The answer is that, approximately speaking, it isn't. The nodes' primary function, is as a thing for the connections, to connect. It is the strength (or weight) of the connections that is the information. The node may, in some sense, correlate to a concept, but this mapping is more or less arbitrary, and there is nothing about the node itself that makes it map to this concept; it is the strength of connections to other nodes that gives it that meaning. Ok, what the hell did all that mean? A concrete example may help here. Let's say we have a node in a network, and it happens to correlate to the concept of “dog”. Its connection to the node (which correlates to the concept of) “furry” will be strong, so if the “dog” node is activated (lit up, firing, turned on, or whatever 'activated' means for this network) then the “furry” node will be stimulated (more likely to turn on), and vice versa. It's connection to the node (which correlates to the concept of) “scaly” will be very weak or even have a negative weighting (i.e. activating one node will suppress the other). 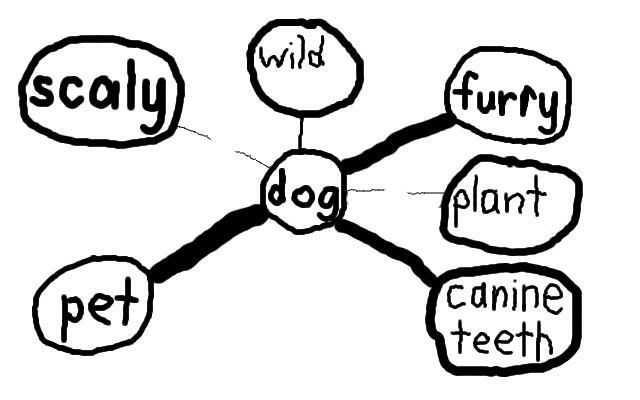 The connections to “animal”, “pet”, “canine teeth”, “loyal”, “trainable”, “mammal”, and “social” (not all shown in this drawing) will be strong. The connections to “plant”, “extinct”, “beak”, “alien”, “purple”, and “flying” will be very weak or even negative. 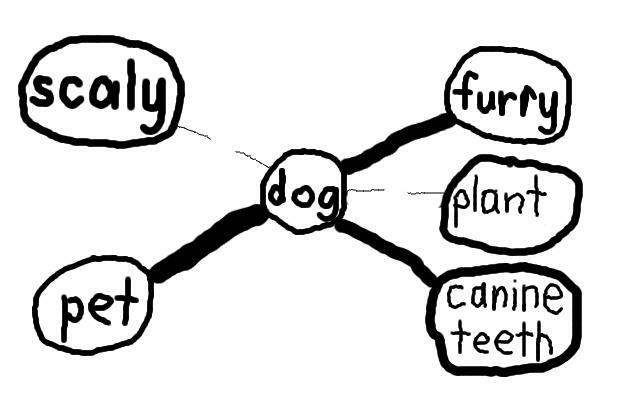 What then, does the node for “dog” need to have, to make it contain the information represented by the concept “dog”? Imagine that I were to tell you this riddle: 'animal, pet, canine teeth, loyal, trainable, mammal, social, furry?' Would you find that a difficult riddle? I could also add, “NOT plant, extinct, beak, alien, purple, or flying,” if you needed it. The “dog” neuron in your brain has many more connections (positive and negative) than this. What is left for the node itself to hold? Approximately speaking, nothing. One somewhat confusing part of this is that these other nodes that “dog” is connected to, are themselves just as “empty” of content. The “animal” node, the “pet” node, the “canine teeth” node, are themselves as arbitrary as the “dog” node, but each one is connected to the right other nodes to give it meaning. The “furry” node is strongly connected to “dog”, “cat”, “wolf”, “bear”, “muppet”, “shag carpet”, and so forth, and has weak or negative connections to “snake”, “raven”, “wood”, “glass”, and so on. The nodes, have no information in them. The connections are where the information is. Note that these connections do not have to be all the way to it's maximum potential, or else at its minimum (i.e. they don't have to be 0 or 1). If the connection from “dog” to “wild” is, say, half strength, or a third, that still tells us something. Dogs can often be wild, but often they aren't. In explaining all this, I don't wish to give the impression that everything about how neural networks (or connectionist networks generally) is well understood, even by experts. But we know enough to know that the connections (e.g. synapses) are more important than the nodes (neurons) themselves. The connections can also vary in more than just their strength. They could also vary in their frequency. In other words, the connection between two nodes could be not only strong, but active, with some sort of signal passing along the connection more frequently than in other connections. This is another area where there is still much to be learned, but we know enough to say that it is important. HOW DOES A CONNECTIONIST NETWORK LEARN? Here again, we have only the basics of an idea (or rather, several competing ideas) as to how connectionist networks learn. However, there is something to go on besides simply plausible guesses. Based on early experiments with neurons, Donald Hebb wrote that once neuron A has caused neuron B to fire (or at least helped cause it to fire), it is more likely to be able to make it fire thereafter. This is sometimes summarized as, “neurons that fire together, wire together”. For example, let's suppose that the neuron representing “friendly” fires at the same time as the neuron for “dog”. It is likely that other inputs to “dog” (e.g. “furry”, “animal”, “four-legged”, etc.) were the main reason for the “dog” neuron turning on and firing. However, the mere fact that “friendly” was firing when “dog” fired, will reinforce the ability of “friendly” to cause “dog” to fire the next time. If this is a frequent event (in other words, if “friendly” is usually firing when “dog” is caused to fire), then the connectionist network has created an association between “friendly” and “dog”. If on the other hand “mean” fires frequently when the neuron “dog” is firing, then we will instead get an association between “mean” and “dog”. Our experience with dogs, will help determine what we think of them. There is nothing one-way about this, by the way; “dog” could just as easily serve as an input to “friendly” (if we think dogs are mostly friendly, we may be more amiably disposed to someone who has a dog with them). Connectionist networks can have different learning algorithms, but they all share the fact that they use feedback to modify the connections, and that allows them to change over time (i.e. learn). Connectionist networks are by their nature able to handle shades of gray (“friendly” may have only a modest influence on whether “dog” fires or not, rather than 0 (none) or 1 (lots)). Connectionist networks by their nature also require repetition and feedback loops. This means that connectionist networks do not learn instantly, in the way that, for example, a computer can be “taught” how to run Excel more or less instantly, by having the software loaded into its memory. Teaching a connectionist network takes repetitions. This is, sometimes, a disadvantage. However, it can also be a source of reliability. Humans make many mistakes of memory, compared to a computer, but they rarely get things wrong so completely and irrevocably as a computer can do if programmed incorrectly. When we optimize, we should ask ourselves, 'optimizing for what?' If we are told that something must be 'perfected', or made 'efficient', it is often the case that we are not told what it is to be made perfect for, or efficient at. This is a good way of putting you at a disadvantage in a debate, since it is difficult to argue that things should be more imperfect or less efficient. It is a way of assuming the point that is to be debated. Do not let this slip by you; ask the question (if not out loud, then at least to yourself), perfect at what? Efficient at what? Too often, our systems are made with a sort of pathological optimism built in. The objective is (mistakenly) taken to be making the best case scenario as good as possible. The possibility of mishap or unknown problems, if raised at all, is brushed off. What if something goes wrong, does the schedule have enough slack in it to recover? The answer may be something like, “we can't have anything go wrong with that, failure is not an option.” Brave words, but brave words win no battles. Failure is always an option, whether we want it to be or not. The better course, and the one which will prevail over the long term, is to optimize for failure. This somewhat counterintuitive phrase simply means, make sure that even if things go badly, you are still in a tenable position. It is hard to come up with a better example than George Washington's military leadership in the American Revolutionary War. Leading a new army against a numerically superior, better equipped, and more established one, he well understood that he was always one decisive defeat away from losing the war. He optimized, then, for minimizing the consequences of failure. He frequently lost battles, but always withdrew with his army intact and in good order. The British troops (and their mercenary allies) could not win the war, though they won many battles. In the end, Washington did have to win one big battle to end the war successfully. But he optimized his strategy prior to that point (in other words for almost the entirety of the war) to reduce the consequences of failure, not to maximize the chances of success in a given battle. Optimizing for failure is a characteristic of connectionist networks. In any given situation, with perfect knowledge, one could design a more efficient (for success) system. Connectionist networks utilize parallelism, and this always involves duplication of effort. In a similar way, command economies (such as communism) can always be more efficient at a task such as industrialization, so long as we are certain we know what the correct course of action is. Thus, for example, when a backwards economy needs to industrialize, but other economies have already done this before them, a command economy can be very effective at doing this quickly. Early 20th century Russia and late 20th century China are two good examples of this. Once one arrives at the edge of what is known, however, the question becomes what to do next? No one knows for sure, and history is littered with industries and inventions which were thought to be necessary for the future, that in fact were technological dead ends. Which one should be pursued? The parallel processing approach, is to try them all at once. Whichever achieves the most success, will have more resources invested into it. Those whose early promise is never matched by real success, will wither. Once you know that airplanes are a better idea than zeppelins, it is trivial to say that it would have been better to have invested all the effort into airplanes, and none into zeppelins. But, if you had used a command economy approach, it is possible that all one's resources would have gone into zeppelins, and none into airplanes. For a marginal improvement in the result when you guess right, one runs the risk of catastrophic failure if one guesses wrong. Imagine the course of World War 1 if the allies had bet entirely on zeppelins, and only the German and Austro-Hungarian armies had both zeppelins and planes. This is typical of a connectionist approach. The consequences of failure at any node, are relatively small. Some duplication of effort is inevitable, and this will always frustrate those who would optimize for success. But nodes fail, in any system, and if you optimize for success you will have greater successes, but more devastating failures. There is a similar principle in biological systems, such as species. Suppose you have a species which must migrate each year, perhaps to find a mating ground where there are fewer predators, then fly back to warmer climes to find enough food once the young are old enough to fend for themselves. Would it be better if all of the individuals made it to the mating grounds every year? Clearly, it would not. Having 100% of your adults at the mating site is good if things go ok, but what if a freak hurricane hits that spot, or a disease with high mortality is spread there? The entire species could be wiped out, or at least lost almost all of its genetic diversity. The species would be better off if a few percent of the adults got lost every year. This leaves them with only, say, 95% of the species' adults able to procreate that year. In every year, this will reduce the number of young by a few percent. However, once in every century or two, it will avoid the possibility of a species-eliminating disaster, because there will always be a few adults that are elsewhere that year. For similar reasons, it is always better for there to be some genetic diversity in a species, even though in any given year there may be one specific DNA string which is best. Diversity always means that we are short of the naive optimum, but for long-term survival, diversity and parallelism are the best guarantees of success. More precisely, they are the best guarantees of surviving failure, and in the long run this is necessary for success. It is well known that capitalist economies, during the 20th century, outperformed communist ones. Less well understood is the reason why. Before discussing that, let's talk about a few myths, or reasons which people believe explain capitalism's superior performance, which are in fact false. The most commonly believed is greed. In this myth, it is believed that communism failed due to the free rider problem. Because a person who works harder in a capitalist economy reaps the benefit, they have more incentive to work. In a communist economy, it is thought, this is not true, and there are in addition many who do not work because they suffer no penalty for doing so. This myth is the easiest to dispatch, for the simple reason that many communist economies attempted to harness greed. Various incentive programs, wherein someone who exceeded their quota received a bonus of some sort, were tried in almost every historical communist economy. In addition, there were plenty of examples where those who did not work were threatened with worse than a lack of pay. Communist governments were by no means unwilling to threaten the lazy with harsh treatment, much harsher than a capitalist economy or government would. If greed and self-interest were the reasons for capitalism's superior performance, then a communist economy which gave bonuses to those who produced more, and harsh punishment or death to those who worked less, would have performed as well or better than capitalist ones. The instinct for self-preservation (don't send me to the gulag) is at least as strong as greed. In fact, they did not perform as well, so the advantage to market economies over command economies lies elsewhere; it is not because of greed. For every visionary captain of industry (let's assume for the moment the person really is smart), there are a whole host of witless windbags who ran their business poorly. Our impression of the savvy of business leaders is much inflated because our society tends to spend most of its attention looking at the winners. Anyone who has spent time working in a private sector organization, especially a large one, can probably think of examples from their own experience where they witnessed suboptimal performance by those in charge of a business. Most capitalist societies do not have a caste system, so why are these visionary leaders, with their keen strategic insights and prowess at organization and leadership, not in government? They were not born into their position, they could have chosen a government career instead of the private sector. Depending on how the society is structured, people of ambition and talent will either move into government, or not. In a communist society, ambitious and talented people enter government, and with the fall of communism many of the same people moved into industry, and made fortunes there. In capitalist societies, many examples are found of tycoons turning to government once there are no more mountains to climb in industry. So, if the same people who are effective in business are ineffective in government when they try to run the economy, why is that? There are some institutions, such as for example fire departments, whose performance is much more highly regarded by their customers when they are part of the public sector, than when they are part of the (for profit) private sector. The behavior of private mercenaries is also not generally thought to be superior to that of (government-paid and government-run) armies. If this is so, why do the advantages of private (capitalist) businesses not transfer to these sectors? A third myth (insofar as explaining why capitalism outperformed communism) is that communist economies are more corrupt than capitalist ones, and this impedes their performance. It is certainly true that the command economy has many opportunities for corruption. However, it is hardly the case that real world capitalist economies do not, and it is certainly not clear that (to take just one example) the nations of Asia which rely on market economies have less corruption than the ones which are still communist. Nonetheless, the nations of Asia which are essentially capitalist (in recent years this includes China) have grown faster than those who are communist. This also dispatches the idea that communism is actually superior to capitalism, but the so-called communist economies were not really communist. It is true, but irrelevant, that real world communist economies were not run according to the principles of Marx and Engels, because one could equally well point out that real world capitalist economies are not run just as Adam Smith, or even a more modern thinker such as Friedrich von Hayek, would advise. Real world capitalist economies do better than real world communist ones, at least over the long run, and that is what needs explaining. One could argue that a communist economy peopled by angels would do better than a capitalist one (I personally have my doubts), but that is not relevant to the question at hand. Why do REAL WORLD capitalist economies do better than REAL WORLD communist ones? A proper explanation would also explain why the early Soviet successes in (nearly) catching up to the West occurred, as well as why they were not followed by a period of Soviet preeminence. Instead, the nation that had gone from nearly feudal to major industrial power in a few decades, entered a period of (as it turned out, terminal) stagnation. China's Communist party similarly wrenched their nation's economy from a feudal system into an industrial one, but then found itself obliged to convert to a capitalist (although undemocratic) system in order to progress further. The actual reason for capitalism's superior performance, in most places and times, is related to the question of optimizing for failure discussed above, but it applies to more than just new technologies. 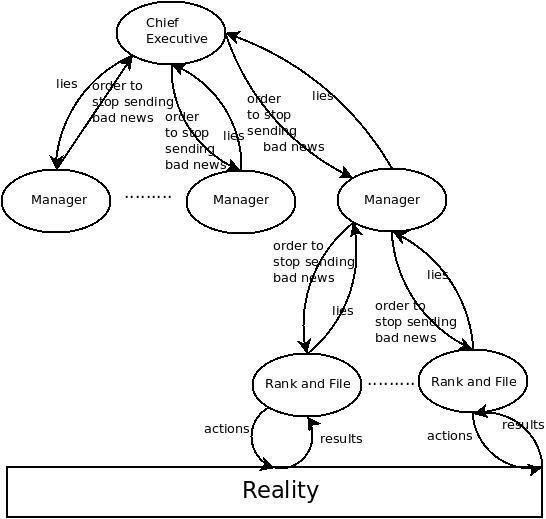 It is tightly tied to the problems of any organization which is hierarchical, whether it is governmental or corporate, when dealing with failure. Begin with an institution, call it X. X may have done something well in the past, or it may not have. Regardless, it has achieved substantial size, and is run internally in a command hierarchy fashion. Whether it is a dictatorship, a democratic government, or a corporation, internally it is hierarchical (even if externally it may be competing in elections or a free market or whatever). For whatever reason, X has done something wrong, something of strategic importance. How it came to make this mistake is almost irrelevant, since every large (or small) organization (or person) will make mistakes from time to time, even on something important. Now consider how it responds to this. If the evidence of the mistake is overwhelming and sudden, then perhaps X will change policy. Suppose for the moment that we have the more common case, in which the negative consequences of the current policy become clear only gradually. Also, as is most often the case, let's suppose that the consequences of the mistaken strategy become more severe over time; the longer it takes before you correct the mistake, the bigger the cost will be. At some point, a person inside X may decide that the strategy is flawed, and advocate a change. If this were something that all concerned agree was not only unforeseen, but unforeseeable, then it may happen. Usually, however, with the benefit of hindsight, it is possible to imagine how the dubiousness of the current strategy COULD have been foreseen. Moreover, it will still be plausible (for a while, at least) to hope that the current strategy might turn out to be correct after all. When faced with a choice between admitting that they were wrong (when they could have gotten it right, and so deserve some blame), or hoping that events will turn out to prove them right after all, almost all people will choose the latter option. Thus, the strategy is not changed. More time passes, and the current strategy continues to be the wrong one, and the consequences become more negative. Now, if they admit that things are going badly, most decision makers inside X will have no doubt that they bear some of the blame for having stayed with the current strategy so long, because they did not listen to the first doubter's warnings. Moreover, the blame is now much greater, since the strategy has been the cause of more problems (the longer it takes, the more painful the correction). Even though the chance of future events proving the current strategy correct has diminished substantially, the emotional cost of admitting that the current strategy is wrong have also grown. Not only will X not change strategy, it will quite likely become a hostile environment for those who voice doubts about the strategy. Now, tribal emotions come into play. Having taken sides, with most people (as ever) on the side of the status quo, the minority group (those who advocate a change in strategy) become the subject of ancient and deeply-ingrained traits of the human psyche. The ones advocating change are now seen as the Other, the Enemy, and as events continue to provide evidence of the current strategy's failings, the majority can imagine the howls of glee and gloating delight of their foes when the inevitable finally happens, and they have to admit their mistake. Whether the initial doubters would actually behave this way or not is irrelevant; they might, and the decision makers of the majority can imagine that they would. It is unbearable. Their hatred of the doubters, and their preferred alternative strategy, becomes ever greater. The great and lasting advantage of a capitalist economy, is that it provides a process for institutions which are entrenched in wrong policies, to be either supplanted or forced to change. Perhaps 90% of all those with an opinion may endorse the wrong policy, in which case no socialist economy, not even a democratic one, will alter it. All of those with high positions of power may favor the wrong policy, in which case no communist economy will correct it. However, if a startup is able to steal market share from their larger rivals by adopting a superior strategy, then it does not matter if the older institution ever learns or reforms. If it does not, the newer one will replace it. Like the evolution of superior DNA by competition and extinction, no institution needs to change its genetic code for the economy generally to change. If it can change its production method/market research system/pricing scheme/product type/whatever, that is all to the good, but more important is what happens if (for reasons listed above or for any other) it cannot. It will be replaced, over time and without any political entity having to decide that this should happen. It does, however, require that political entities not be able to prevent this from happening. It is for this reason that command economies, over time, under-perform market economies. Market economies have a non-political way of retiring institutions such as X, above, which have entered the death spiral of fixed policy. Incidentally, it is also the reason why innovation more often comes from new companies than from old ones. What does any of this have to do with connectionist networks? Another way of looking at this, is to view the economy as a network. Data must, in any network, pass from one node to another. 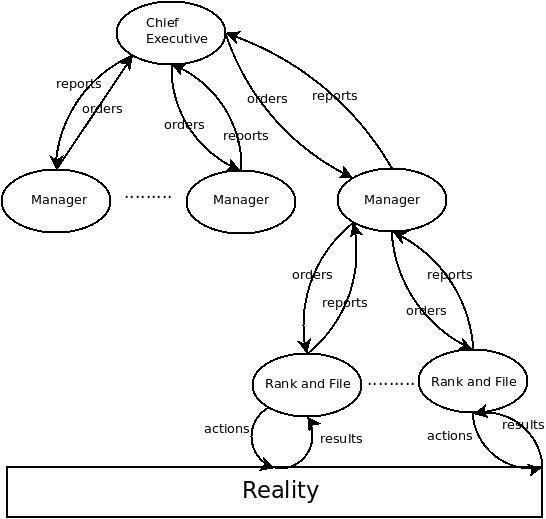 In a command economy, as in any other hierarchical structure, the data passes upwards as requests or reports, and then data passes downwards in the form of commands (quotas, directives, regulations, policies, etc.). To see what is wrong with this, we must look at what happens at the top of the hierarchy. The humans who process information at each node in a hierarchy, utilize neural networks (their brains) to figure out what to do. Intrinsic to this is a feedback loop. They try something, they receive feedback as to what happened, they correspondingly feel either better or worse. In an executive, the feedback they receive is in the form of reports from below, telling them what happened. They issue orders, including orders on how to rearrange the nodes below them (reorganizations, promotions, firings, executions). If every node below the executive was nonhuman, this might perhaps work (although probably still not as well as a distributed network). However, the nodes below them are also run by neural networks (human brains), doing their own feedback loops. Data comes to them, they decide what to pass on to the node above them (the executive). They want to optimize for the response of the executive (i.e. they want the boss to be happy with them). figure out how to make the situation better, which may be very difficult, and which may not even be possible to figure out if the situation is very complicated (as it often is for large institutions). Figure out how to make the nodes below you stop bringing such data. This is fairly trivial to figure out how to do (yell at them, set a quota for higher performance, etc. ), and also easy to actually execute successfully (if you yell at them, they will stop bringing such bad news). figure out how to mask, rearrange, spin, or just plain fabricate the data to be more acceptable to the executive next time. The easiest way to do this, is to imitate what the executive did to them, and essentially punish the nodes below you for bringing such bad news. If the nodes below you don't bring bad news, you won't have to bring it to the level(s) above you. There is an iterative process here, and it will descend to the bottom ranks of the hierarchy, where it will run into the unyielding bedrock of reality. However, institutions which are very large are often the inheritors of previously accumulated wealth or advantageous position, and it is often possible to ignore this reality for many years. The more successful the institution had been in the past, the longer it can ignore reality, and the more entrenched the bad habit of spinning, rather than addressing, reality will be, until the time when it is no longer possible to ignore the underlying problem. When command economies need only imitate the processes of other, perhaps more innovative peer institutions (e.g. a command economy industrializing when other market economies have already done so, or a large corporation copying the product which a startup company pioneered), then option (1) above is plausible, in many cases at least. It may be painful to change, but at least it is clear what change needs to be made. Thus, the flow of data from the lower nodes to the higher ones is not as likely to be corrupted, or is not corrupted as badly. When operating at the forefronts of technology, though, centralized hierarchies are most likely to fail. Even between market economies, though, there can be marked differences in the response to failure. One way in which they can differ, is in their legal attitude towards bankruptcy. If an economy had an unforgiving attitude towards bankruptcy, we would not for that reason say it was not market-oriented, but it would have forfeited many of the advantages of a market economy. Bankruptcy is, for a business, a way of admitting to a failed strategy. Note that I do not say admitting to a “mistake”, because it is often the case that it was not. Information about the future is always imperfect, and nonetheless we must place our bets somewhere, if only to decide to keep the money in our pockets (a bet on the fact that the money we have right now will be sufficient for our needs). To illustrate, consider a would-be entrepreneur. He or she may know of an opportunity (untapped market, new product, etc. ), but not know for certain how likely it is to pay off. Or, she may know for certain that it has a 50% chance of paying off, at triple the money put into it. Most of us would say that it would be a good idea to take the chance. Now, let's say there are many such opportunities, and many entrepreneurs. If they all take the plunge and try to make a go of it, then half of them will be congratulated for their success, and half of them will be failures, even if their talent and execution were all the same. Conventional wisdom says that the ones who succeeded were the wiser, or harder working, or more clever, but it need not be so. Market conditions are as predictable as the weather, which is to say that even those whose profession it is to predict it, are often wrong. Fashion is equally capricious, and many a designer with a long string of victories behind him may find that this year's line falls flat. The superior system, therefore, is the one in which any opportunity with a 50% chance of paying off at 3 times the money put into it, is an opportunity which someone will take advantage of. The overall economy will clearly be better off. But, are the entrepreneurs who need to actually do this, better off? Individuals fortunate enough to bet on the right opportunity will be, clearly. But, what of the entrepreneurs as a group? In fact, half of them will have placed their bets on the wrong opportunity. When faced with a chance to either become a great success, or else a failure for life, most rational people will search for a third option. That option is available, if the market has a good bankruptcy law. Knowing in advance that there is a 50% chance of failure, an entrepreneur can make an attempt, and if it doesn't work out they have a way (unpleasant, but not life-wrecking) of getting out (and perhaps trying again at another opportunity later). In the absence of such an out, many opportunities which are (from the point of view of the overall economy) good bets will end up going un- (or under-)utilized. Bankruptcy minimizes the costs of failure (to the individual), and for that reason it can be a great boon to innovation for the economy as a whole. In the example below, an economy with an easy bankruptcy law will have 4 successful entrepreneurs, whereas the economy with a harsh bankruptcy law will have only 1. The cost of the unsuccessful entrepreneurs is far less than the benefit from successful ones, so the economy with an easy bankruptcy law will be far better off. Note that this all implies that there is often imperfect knowledge. Each business opportunity is, in fact, either a good one or not, but quite often it is not obvious to those who are called upon to place their bets on it (or against it). Also, that the entrepreneur who becomes rich, with his face on the cover of business magazines, may differ from others who wagered and lost primarily only in the fact that he was luckier (not smarter, and also not greedier). There are many (across the political spectrum) who are not comfortable with admitting this fact. Our brains (and those of other animals) are a kind of “neural network”. This is to say, we have a lot of neurons, and they're networked together. The “node” in this network is a kind of cell called a neuron. The neuron's specialty is to trigger an electrochemical pulse. What does that mean? It means it can carry an electric current, albeit a small one. Unlike metal wires, though, the current isn't carried by just electrons, it's carried by ions that have an electrical charge (which for our purposes here is an unimportant detail). The neurons have synapses, which are basically connections to other neurons, but they can be very long, extending like a miniature cable to neurons in other parts of the brain. There is a very small gap which prevents the electrochemical current from crossing this synapse in its rest state. However, if enough electrical potential builds up in the neuron, it can cross this threshold, like electricity arcing between two wires that are very close to each other but not touching. One interesting thing is that this changes the electrical potential in the second neuron. If enough of the neurons it is connected to are firing, then its own potential will build up past the threshold, and it will fire as well. So, if the neurons “pet”, “loyal”, “furry”, and “canine teeth” are all firing, this raises the potential in the “dog” neuron, until it fires as well. Once it does, it makes it easier for other neurons with which it is connected to fire as well. If you have been “primed” by seeing the words “fruit”, “red”, “sweet”, “tree”, and “pie”, you will probably find it easier to think of the word “apple” if you see a picture of it, because the neuron has been pumped up closer to the threshold by the firing of other, connected neurons. One (unanswered) question is, what does this feel like? When I am almost, but not quite, able to think of the word I want, does that mean there is a neuron (or group of neurons) in my brain which is almost, but not quite, firing? How does the rest of my brain know that it is close, so that I have that “on the tip of my tongue” feeling? If anyone tells you they know how this works, and they are not from the future or members of an advanced alien race, they are lying. But we do know, that if different neurons often fire at the same time (e.g. “dark” and “scary”), then whenever one is activated, the other one will be more prone to fire. Just because we don't know everything (or even most things) about how the brain works, doesn't mean we can't speculate. :) One of the most fascinating examples of such speculation is “The Origin of Consciousness in the Breakdown of the Bicameral Mind”, by Julian Jaynes. In this (highly speculative) work, Jaynes puts forward the hypothesis that the ancient Greeks (meaning the ones that even Socrates and Plato would have called the 'ancients') and other equally ancient humans, had a much more rigid division of their mind into two halves (hence “bicameral”). We know that this is possible, and it can lead to the person “hearing voices”, which are in fact coming from their own brain. Nowadays, we call such people “crazy”. Jaynes posits that the conscious part of the brain operated separately from the logical and rational part of the brain, and could only receive guidance from it when it heard voices (which it might attribute to the gods, or dead ancestors). Essentially, one part of the brain was responsible for consciousness and emotion, while the other was responsible for forethought and reason, and they communicated but were not (in the modern sense) integrated. Who knows if it's true? Jaynes' theory is highly controversial. That such a situation can happen for individuals at least, is certainly true; in rare cases people suffering from life-threatening epileptic seizures have the connection between their brain's left and right halves cut surgically. In modern humans, it is the verbal (left) half of the brain which does the talking, and which we think of as being conscious. However, it is possible to learn language in different parts of the brain (e.g. speech in languages learned in adulthood often does not originate in all the same parts of the brain as languages learned from birth or early childhood). As to which part of the brain is “conscious”, experiments on the aforementioned subjects with separated left and right brains indicates that they are both able to think, and even to have opinions (on things like whether to get dressed and go to work or not). We have really very little way of knowing if they are both conscious or not, but experiment suggests probably so. Could we, even in modern times, be carrying around more than one consciousness inside our heads (the one 'you' are, and another which is trapped in there with 'you', able to impact how you feel occasionally but most of the time just along for the ride)? The important concept to keep in mind (pun intended) is that, with the same hardware, it is possible to organize a connectionist network (such as a brain) in more than one way. We have little doubt that humans living in the time before language, organized their brains at least somewhat differently from us, and no particular reason to think that the leap from pre-linguistic brains to the modern brain happened in one generation. Regardless of the truth or falsity of Jaynes' thesis of a more recent change in brain organization, there had to be at least one (and perhaps many) generations in which the old (pre-linguistic) and new models of brain organization struggle for dominance. Whether we went from a pre-linguistic model of brain organization directly to the modern one, or instead had several other ways of organizing our neural networks in between then and now, is not only unknown but perhaps unknowable without a time machine. Once we posit that there can potentially be more than one consciousness in a network, though, and that it might change depending on how things are organized, it raises another question. Can the two consciousnesses struggle for dominance inside the same connectionist network? Can a mind which is organized one way (perhaps in Jaynes' “bicameral” method), change its organization to another (perhaps the modern one)? What would that feel like, to the neurons that were the battleground of that fight? Would they have any way of knowing that it was happening? If we were nodes in a network that had such a struggle for dominance going on, would we know? In order to understand a complex system, you have to break it into parts (in your mind, anyway). Unfortunately, nothing guarantees that this is possible, or if you do it, that the way you break it into pieces is the right one. Human knowledge is composed of more or less arbitrary fields of knowledge, which overlap. Physics and Chemistry have a shared boundary; smaller than this, we call it particle physics, larger than this, and we call it chemistry. Larger yet, we call it biology. It's not that these boundaries between one field of knowledge and another are useless, but they are a human invention, not a thing that was discovered, but a shared fiction, similar to how borders between nations are a human invention and not (necessarily) a geological feature. A less fortuitous fictional boundary, is that between history, economics, and politics. Economists tend, typically, to take the government as a given; assume this kind of government, what sort of economy results? The most gratuitous failure of this was Marx and Engels' inability to see that the communist economy they proposed would lead to a government that was corrupt and vicious. They saw as well as any in their field (at that time, perhaps even still) how economics and politics could intertwine, and yet it did them no good at all when trying to decide how to find a combination of the two that would work. The most important thing which even modern economists fail to attend to enough (if at all), is that economics is not only impacted by politics, but the reverse as well. Governments do not spring fully formed like Athena from the skull of Zeus. They are shaped (or warped) by the economy they are coupled to. Government is a way of getting things done, and anyone with money (or other equivalent means of influence) will see this. If they have two possible ways to invest their money, one of them in research on a new product for the market, and another in political donations to give them a legally mandated advantageous position, which will reward their investment more? The typical economist's reply is, that this is a reason for governments not to do this sort of thing. Which is about like saying that stones should fall up instead of down. Any architectural design, however beautiful and (in theory) efficient and inexpensive and wonderful to live or work in, that required stones to fall up instead of down, is a bad design. If politicians need or want money, and they can get it in exchange for doing their job one way instead of another, what is to prevent them from doing it? One answer is to make it illegal. But it's the government that enforces the law, and the government that we're talking about. The members of government will have little reason to make the laws airtight, without loopholes that allow legal bribery (e.g. making it legal to donate to election campaigns, or to hire ex-politicians as lobbyists). Another answer is that a free press will report the scandal. There are several problems with this. One is that everyone in most advanced economies knows full well that those with more money get more favored treatment from government, so they will not rush out to buy another newspaper that tells them so. Another is that, even if the public does react with outrage, if they react by voting the scoundrels out, and voting a similar group of new scoundrels in, there will be no change. It is much like saying that the way to prevent financial bubbles, is to wait for the market to punish them when the bubble bursts. Empirical evidence tells us that this will not prevent a new bubble from forming (or not for long, anyway). Empirical evidence similarly tells us that one pack of scoundrels being voted out will not prevent the next bunch from behaving the same way. Why is that? There are many possible reasons. One popular answer is that “power corrupts”. Which is just a way of restating the question as the answer. Why does it corrupt? If we think corruption is bad, why can't we stop it? Another possible answer is that government attracts the wrong sort of people. This is a little better, and probably at least somewhat true. However, it is not at all uncommon for a former government official, once they are out of office, to become an especially adroit commentator on the problems and misfortunes of government (especially if the circumstances of their leaving make any return to office impossible, so they can speak freely). The fact that politics turned them dishonest is made all the more intriguing if we note that once they have left politics, they can often turn honest again. More commonly, someone who was upright before they became a politician will usually start to behave like a typical politician once they are in office for a while. A better explanation is to look at the incentives of the political career. What does the politician typically want? Surely in some cases at least, it is to be noticed, and regarded as a person of importance. In other cases, it may be a genuine desire to do good (and we should not be surprised if these motives are both present in the same person). In other cases, of course, it may be simple greed for money, but even in economies where greater fortunes are to be had in the private sector, we still see no shortage of problems with elected officials acting on behalf of moneyed interests more than the general public, so greed cannot be the whole story (since the greediest would all be in careers as lawyers, bankers, or corporate executives, if that's where the real money is). The necessity of money in order to remain in office is surely a part of the problem, leading some to advocate public financing of campaigns, to remove this leverage for money upon government. Perhaps this is a good idea, perhaps it is not, but it cannot be the whole solution (or even most of it). Why not? The reason why not, is that money is convertible, by its very nature, into whatever manner of good or service is required for a given task. When the task is “influence the decisions of government”, then money will be converted into whatever form is appropriate for the job of influencing government. If what is influential to government is the opinions of former government officials whose opinion is still weighted heavily, then those former government officials will be hired as lobbyists. If what is influential is data in reports, then researchers will be paid to produce reports with the data to influence decisions in the desired manner. If what is influential is popular opinion in a certain class or district, then advertising will be purchased, and will run clever copy written by well-compensated marketeers, to influence popular opinion in the way desired. If what influences government officials is the opinions of the clergy, then the church will be plied with donations (of money). If what is influential is the opinion of economists, then economists with the desirable (from the point of view of the ones with money) opinion will find they have newspaper columns, book contracts, prominent positions in endowed chairs at universities, etc., while economists who have different opinions will have a curious lack of patrons. Money converts itself into whatever good or service is needed at the time; that is the basic function of money. If the economy is a monetary one, then the government will be influenced by it. Money, essentially, IS influence. This isn't necessarily a bad thing, and in fact for most purposes the convertibility of money is precisely why it is good. But it renders any effort to nullify its influence on government in vain, whether you are progressive champion of the poor or libertarian upholder of laissez faire capitalism. Capital will not “laissez nous faire” (leave us alone). Capital's function is to change how people act. What insight does it give us to analyze the problem from a network point of view? 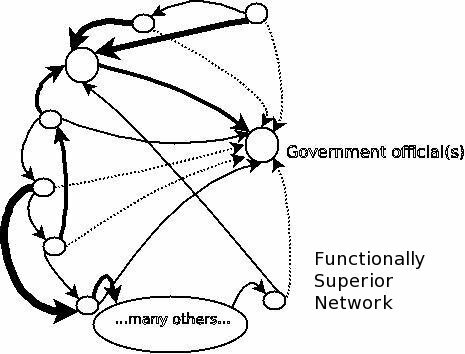 Let's look at the system of (government + private sector) as a series of nodes and connections. 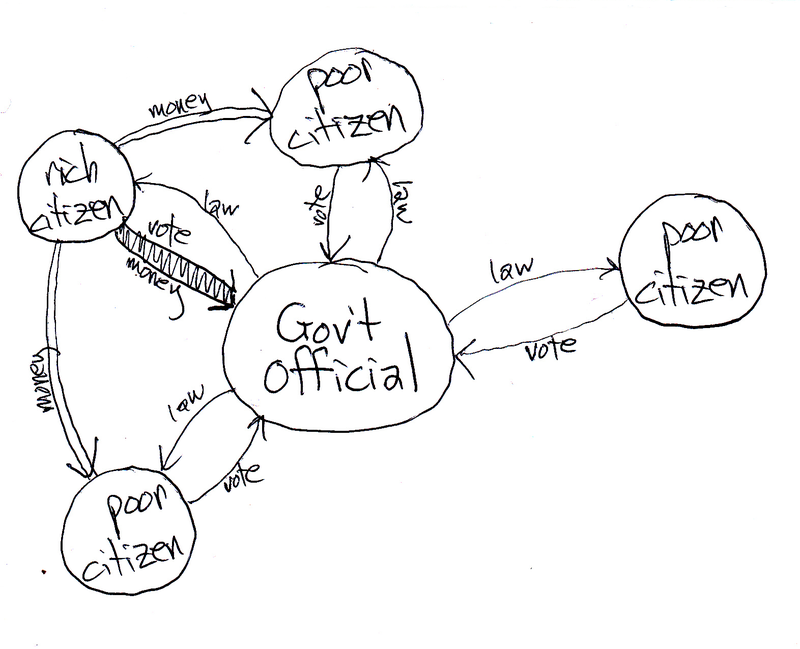 Each government office is a node. The decisions (votes, rulings, etc.) are signals coming out of these nodes. The money coming in is also representable as signals. The government official node sums the inputs (positive and negative), compares it to a threshold, and either “fires” (as a neuron fires) or doesn't. The theory, in a democratic nation, is that each citizen node should have their input weighted the same as every other. In a money-based economy, though, this is probably impossible for any decision which is based on anything other than direct election (plebiscite), and maybe not even then (since votes can be bought, directly or indirectly). A node with more money is able to fire more often (it has more signals, i.e. money, coming in, therefore it is able to fire and send its own signals out more often). There is no network system which can prevent this node from having a larger influence on other nodes because of this fact. As long as the connections between nodes consist primarily of money (in other words, as long as it is a monetary economy), those with more money will have more influence. The reason why all attempts to prevent money from influencing government are doomed to fail, is that the entire rest of the society is based on giving those with money more say. If I have more money, I have more say in where the resources of others are put (into making my car rather than yours, building my house rather than yours, sending me on vacation rather than you, educating my children rather than yours). The critical failure of attempts to keep money from giving some people more influence over government than others, is that government is just another part of society. It is not an order of monks, cut off from society and separate from it. It is composed of people from the society, operating as part of the society, and interacting with it in all the normal ways. To prevent the advantages of money from influencing government officials, it would be necessary to remove them as nodes in the market network; let them buy nothing, let them use nothing which is bought for them. It is questionable whether this is even possible, but there is no question that it will not be done. Money will convert itself into whatever form is needed, which is to say it will use any connection needed to get from one node to another; the only way to prevent this is to cut every connection between the nodes of government and the society it rules. What, then, can be done? Shall we resign ourselves to a government by bribery, with the force of government brought to bear on behalf of whoever bids highest, like the latter days of the Roman Empire when the title of Caesar was bought and sold? It is at this point that the author must admit to a certain childish glee in being able to offend the sensibilities of both right and left wing politics. There is a certain symmetry in this which is undeniably pleasant. I have no illusions that any advice from me will be heeded by anyone, so this is my only return for stating the truth baldly and as clearly as possible. First, to offend the Left. The only way to prevent money from purchasing the services of government to its own ends, is to cause the services on offer not to be sufficiently tempting to fetch a good price. In other words, if the power of government is limited, then the moneyed interests so eager to influence it before, will become quickly disinterested. Anarchy is unlikely to be productive, since this would cause the wealthy (nodes) to purchase government-like services (such as armed security) for themselves. However, severe limits on the powers of government is needed in order to insure that bribing government is not too profitable. In a monetary economy, if the government does much to regulate and structure the economy, it will inevitably do so most often on behalf of those with more money (on balance), not for those with less. An activist, progressive government, which regulates the economy (i.e. society) in many ways, will inherently be more corrupted by money because of that very fact. If it is powerful, it will be taken over on behalf of those with money. The only way to minimize the influence of money, is to limit the powers of government, or abolish money. Similar, although lesser, advantage can come from splitting the powers of government among many levels and locations, as it is more expensive to influence many local governments than one central one (which is why big business almost always supports centralization of power at the federal level, to the great frustration of right-wing idealists, who imagine big business to be their political allies). Now, having offended the Left by declaring the ideal of progressive, powerful government impossible even in theory, we move on to offend the Right. In a monetary economy, it is a necessity that the wealthiest and poorest nodes, not differ in the weighting of their outputs too greatly. The strength of a connectionist network, lies in the fact that the computing is done across many different connections, among many different nodes. The computing power of any one node (whether one neuron in a brain, or one person in a nation) is small compared to the whole. For this reason, researchers into neural network simulations (software or hardware which attempts to use neuron-like or neuron-inspired algorithms) find that it is necessary to use output functions which are exponential, or something like it. In other words, no matter how much input there is, from how many other nodes, each node can only output a certain, limited amount. The output need not, in fact cannot, be the same as every other node, or the neural network will not work. However, if allowed to accumulate any arbitrary amount of input, and transfer this directly to the output (or even just with a straight divisor), a few neurons may take over the network. This degrades its ability to function. If only a few neurons have an output signal so powerful that they overwhelm all others combined, then what you really have is a very small network of just a few neurons. In a nation, there is an equivalent problem. If a few nodes (people) have so much input (money coming in) that they can overwhelm the output of all, or almost all, other nodes (i.e. their money drowns out the voices of others in fields like elections), then the ability of the nation to effectively come to grips with its problems will be degraded. This cannot be a simple linear divisor (e.g. take away a set fraction of your wealth). It must be an exponential function (the more you have, the higher the percentage we take, and beyond a certain point we take essentially all of it). It is neither necessary nor desirable for everyone to have equal wealth, or even approximately equal. 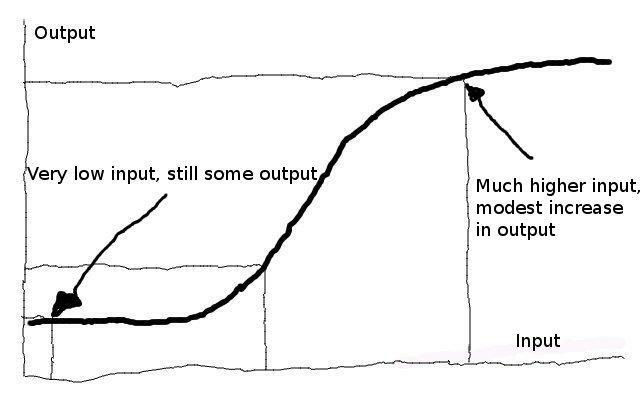 But if one node can have many orders of magnitude more wealth at their disposal then most others, then the computing power of the network as a whole has been degraded greatly because, in effect, the network contains only those few nodes, and the output will suffer because of it. Exponential functions that are most effective for connectionist networks (such as neural networks, or economies) saturate at low and high levels of input. In other words, no matter how little input, the output cannot be below a certain value. No matter how much input, the output cannot be above a certain value. This suggests that, to work well, a monetary economy must both guarantee each person a certain minimal income, and also prevent (e.g. through tax rates which approach 100%) any person from having too much money. The richest can, and in fact should, have far more than the poorest, because a network in which every node has the same output cannot compute anything (imagine a network in which “purple”, “flying”, and “furry” all had equal influence on the output of the node “dog”). However, for a network to allow some nodes to be many orders of magnitude higher than almost all others (e.g. $10,000,000/year compared to $10,000/year), is a sign that it is broken, and has stopped functioning (imagine a network in which “furry” connects strongly to every single other node; when “furry” comes to mind, every other concept in your mind is activated). A network which allows some nodes to fall to almost no output, is also impaired (though not as badly, if not too many nodes are in this state), because the learning process involves multiplicative, not additive, affects. If the node fires at the right time or in response to the right inputs, then the strength of its connections is increased by a certain percentage. But any percentage multiplied by zero, is still zero. It is ok (from the network's point of view) for people to be poorer than others, but not for them to be destitute. If they are destitute, they are effectively not a node at all in the network, and that reduces the computing power of the network. If a few nodes have many orders of magnitude more output than others, then effectively all other nodes are destitute (i.e. too small to influence the decisions of the network as a whole), and the computing power of the network will suffer from that even more. To state it more tersely: if a few people are very poor, that reduces the size of the network by a few nodes, but if a few people are very, very rich, that reduces the effective size of the network to only those few nodes. Thus, from the point of view of network power, the best monetary economy would be one in which the government has limited powers, and those powers it has are divided between local and federal levels. One power it would have in abundance: the power to tax away income beyond a certain threshold. Only one entitlement would exist, and that would be a minimum income. Of course, this recommendation has a central assumption: that the network we are talking about is primarily monetary. We have reached the point where the central thesis of this work can be broached. Connectionist networks consist of nodes, which send some output to other nodes, mediated by a connection which either increases or decreases the strength of the signal. In brains, this is all established and conventional wisdom (if a bit simplified here): the connections are synapses, the nodes are neurons, and the signals are electrochemical pulses. There is nothing special about this kind of connection, node, or signal which is a requirement for the connectionist algorithm to work. In fact, the overall economy, even the society which the economy is part of, can be a connectionist network if it is a monetary economy. The nodes are people, the connections are flows of money, and the signal is the transaction, whether it be purchase, donation, bribe, government contract, government bailout, etc. Whether something of value is exchanged for this money is, from the point of view of the Money-Brain, irrelevant. The signal is what is important, and the feedback loop that enables the connectionist network to learn. There was a time when the Money-Brain was a new construct, forming out of the systems and societies which came before it. The process took centuries, perhaps millennia depending on when you think it began. By the end of the 18th century, the Money-Brain could cause things to happen which few humans that were part of it were even aware of, much less in favor of. It could cause slavery to be replaced by wage-labor, because then there were more transactions (monthly wages instead of one lifetime purchase price). It could cause one society after another to be forced open to market forces. It could diminish the power of the church to force men to donate labor, or anything other than money, while greatly amplifying the power of the church to convince people to give money, because this increased the number of relationships between nodes (people) which were signals (monetary transactions). It could goad mankind into treating all the world's wilderness as property, to be owned and thus sometimes sold, giving it more transactions to make up the signals in its network. It faced challenges, first from feudal monarchy, then from communism, but never ceased in its long process of converting all the world's interactions into money, because it was a connectionist network, and connectionist networks are inherently more powerful than hierarchical ones, because they can adapt faster. There is much to dislike in this rapacious evaluating of the monetary value of everything, but we should not delude ourselves that it caused an increase in suffering. The systems which it replaced were, for the most part, even less respectful of the dignity of human life. A system of aristocracy, or monarchy, or empire, would place a value on only a few nodes (i.e. only a few people). The Money-Brain wanted more nodes, and more transactions between them. It may want the make all people wage-slaves and consumers, but it does not want them to be literal slaves, or starving peasants. Now, though, there is a new connectionist network which is forming. One is tempted to call it the Internet, but of course that falls short of the mark. It is the Internet, and also any exchange of information digitally which happens outside of the Internet, but interacts with it (e.g. telephony, which began as a separate system but is now becoming intertwined with internet-based methods of communication). We will call it the Info-Brain. To understand what its rise may portend, let's speak a bit more about the rise of the Money-Brain. In some sense it began when humans began using money for transactions. The process took centuries, perhaps longer, but there was a point well within recorded history when most transactions began to take place based, not on who was what (e.g. I am the emperor and you are my subject, I am the peasant and you are my feudal lord, I am the cleric and you are the feudal lord, etc. ), but on who had what, and especially on who had how much money (e.g. I am the customer and you are the merchant, I am the shareholder and you are the CEO, I am the banker and you are the person who needs a loan). Since then, the inexorable growth of the Money-Brain has been to convert all other interactions into monetary ones. This means, among other things, that transactions based on charity, or goodwill, or obligation, or physical coercion, or anything other than money, are a disease which the Money-Brain will attempt to expunge or convert into monetary ones. If religion can be converted into monetary donations, by the faithful to the clergy, that are then used to purchase a new building to house the church, then from the point of view of the Money-Brain that is far preferable to the faithful simply volunteering their time and labor to build a church. If a child can be dropped off at a daycare facility, which for a price will watch that child while the parents both work at a job for which they are paid money, then from the point of view of the Money-Brain that is far superior to one parent staying at home to watch the child. If most people can be convinced to stop growing their own food, and instead pay someone else to do it for them, that is from the point of view of the Money-Brain far preferable. And so on; everything which can be converted into a monetary transaction, will be, as the Money-Brain expands in size. Churches, or families, which attempt to stick to non-monetary means will find that the Money-Brain steers economic activity, and government policies, in directions which make it harder for them, and easier for those who take the path of more monetary transactions. What applies to people, applies in this case equally well to nations. Since the Money-Brain is a connectionist network, any nation which has converted its economy to a connectionist (and monetary) network will be able to grow in power more rapidly than one which does not (e.g. a tradition-based or centrally-planned economy). The imperatives of creating ever-more monetary transactions, however, causes the Money-Brain to seek out more people (nodes) and markets (potential connections), and this meshes easily with the ancient human drive for expansion and conquest. The result is that the forces of market economies prise open one nation's market after another. This works well for the initial nations which formed the Money-Brain, but not because of any desire on the part of the Money-Brain to benefit them. It is more or less as if a neural network were adding neurons and synapses; the point is to benefit the brain, not the neurons and synapses. In broad outlines the Money-Brain will certainly want the nodes which compose it to be at least preserved, but that they should prosper is not any particular aim of the overall network. You are not trying to get your neurons to have more input; you just want to think. You may even take drugs to lower the firing rate of your neurons, if it pleases you to do so. The neurons make up the brain, but the brain does not necessarily act on behalf of the neurons. It is also worth pointing out again that the monetary transactions need not be justified by linking them to anything of actual value (as seen by the people who compose the economy). If, for example, one takes money in exchange for a financial asset, which is only tangentially linked to anything of actual value, this is not necessarily a problem from the point of view of the Money-Brain. Ever-more elaborate financial transactions may seem problematic from the point of view of the nodes (people), but from the point of view of the Money-Brain they are simply nodes and connections. To make a comparison to the neural network: some neurons and synapses are connected to the sensory inputs (optic or auditory nerves, etc. ), or motor outputs (to cause muscle movements), but the vast majority are not connected to either. They are nodes and connections and signals in between sensory input and motor output, that have no relation to the world outside the neural network that we can easily trace, but they are useful to the brain itself. When might the interests of the nodes (people) and the network (Money-Brain) conflict? The most straightforward case would be when new nodes are brought on board. The nodes that are already well integrated (the people of the advanced economies) might want to bring other nodes into the network only if it causes them (the existing nodes) to be better off. Economists will tell you that what actually happens is option (1). They “know” that this is the case. They may occasionally change their mind as to why the answer is (1), but they will rarely if ever change their mind about the fact that (1) is the right answer. This is because it is the job of (most) economists to justify the policies which are most favorable to their patrons, who are the most privileged members of the First World economies. Those are precisely the people who have the most to gain from access to Third World markets (either to sell to or to purchase labor more cheaply from). Even a passing familiarity with reality, however, will tell you that it will most likely be a combination of both options, and additionally that it will be closer to option (2) than option (1). The amount of resources available is finite (at any given point in time, because it takes time to create more wealth), and as new countries' economies are added to the world economy they bring in additional resources, but not in proportion to the number of nodes they add to the Money-Brain (that is, after all, more or less the definition of Third World, that they have fewer average resources per person). Therefore, option (1) is mathematically impossible (in the short term at least). Instead, while there is an open question as to whether the new nodes (Third World citizens) will benefit or not, there is no doubt as to whether the nodes of the First World will benefit from free trade with poorer countries. They will not. In the long run, of course, it is possible that the addition of more nodes to the Money-Brain will results in a surge in its power to extract resources from the environment, and therefore it may be that the average node resources will come back up to the previous level. Not necessarily true, but it is not mathematically impossible (and the only way it can be possible is if the extraction of natural resources globally is substantially increased). That the initial impact to First World nodes (laborers and consumers) will be negative, is guaranteed. If you were told that globalization would make you better off, and you live in an advanced economy but you are not upper class, you have been misled. Globalization does not make you better off; it makes the Money-Brain better off. If you have found it odd that voices in favor of globalization and free trade are always heard loudly in the halls of government, but voices opposed to it rarely are, then consider reviewing the earlier sections on how government is just another part of a monetary network. To turn to another topic, what of lawsuits? In many ways, a lawsuit (or the threat of it) is what happens when we have ineffective government regulation. They are also a safety-valve, of sorts, which have the effect of retarding the growth of government interventions aimed at consumer protection in any (or every) industry. This is because, for every 100 or 1,000 alleged victims who file frivolous lawsuits, there is one who is determined and whose case is such that other people will be sympathetic. If they have the ability to ally with a canny lawyer to avenge themselves, they will do so (as there is a large monetary incentive to take this route, plus a greater likelihood of obtaining satisfaction). However, if that avenue is blocked, then they will take the harder and longer route, of convincing their fellow citizens (and the officials they elect) that There Ought To Be A Law. By giving powerful interests the means to block such legislation, the Money-Brain makes them all the more likely to take up a civil suit. Moreover, those lawyers whose businesses consists of such lawsuits will use some portion of their earnings to persuade government to keep such an avenue open. Thus, the Money-Brain replaces the non-monetary system (citizens ask their elected officials to pass laws to protect them) with a money-driven system (donations to officials by corporations block regulation, donations to officials by lawyers block tort reform, and the monetary awards themselves that result from lawsuits are a third form of transaction that results). To best suit the Money-Brain, everything must be monetary transactions, and the use of lawsuits instead of regulation suits it perfectly. Note that in a hierarchical system, both lawsuits and political action are typically blocked, which is why the aggrieved are more likely to take up with some violent insurgency in the outback. This is one of many reasons why hierarchies are less efficient, and eventually less powerful, than monetary connectionist networks; they convert these interactions into violent exchanges. Having looked for a bit at the Money-Brain that currently dominates the planet, let's look at the new challenger, which we will call the Info-Brain. What is it composed of? What are its nodes, connections, and signals? One might assume that the nodes are people, and in fact people are often nodes in the Info-Brain. However, they don't have to be people, they could be servers or other types of computers. The connections can be social connections between people, such as which other people you frequently exchange email or phone calls with. The signals, are any kind of information. If you are browsing on the Internet, you are downloading information (and perhaps sending a small amount as well, at the very least just by the fact of browsing to different sites which note your browsing patterns, including where you came from and where you go to next). Does just sending and receiving information make you a node in a connectionist network? Perhaps in the literal sense, but what makes a functional node in a connectionist network is the ability to weight many inputs, and then send output to many other nodes (or not, depending on the inputs; sometimes a neuron fires, and sometimes it does not). What the weights are, is not as important as that they be subject to modest change over time, in response to feedback. So a person who browses hundreds of celebrity gossip websites, thinks about this, and then chooses to blog about Lady Gaga rather than Britney Spears, is a node in the Info-Brain (especially if the person then checks how many hits their latest blog entry got, and does more of the kind of thing that got lots of hits, and less of the kind of thing which didn't, which establishes a feedback loop). Just as the Money-Brain does not care whether or not every transaction represents something actually of value, so the Info-Brain does not care whether or not every exchange of information is about something we as people (nodes) think is important. Another person may browse hundreds of medieval archives, think about this, and then choose to write a paper about Chaucer instead of the Decameron (and then get feedback from a few people, perhaps their thesis advisor and two fellow grad students). From the point of view of the Info-Brain, the only significant difference between the two nodes is that the latter probably operates a lot more slowly, and is connected to a lot fewer other nodes. The Info-Brain will tend to create a lot more bloggers about Lady Gaga, and do little to increase the number of theses written about Chaucer (or the Decameron). From the point of view of the Info-Brain, anything which causes information (speech, images, text, etc.) to be withheld, is a negative thing, impairing its ability to function. What are some examples of this? Censorship, certainly, will be negative from the point of view of the Info-Brain. But what about libel and slander? These cause people to withhold opinions, in other words to communicate less. The laws on these are likely to be weakened if the Info-Brain becomes dominant. What about elite discussions, such as those between scientists in a specialized field, or those between lobbyists and the politicians they are attempting to influence? This kind of contained or semi-private conversation limits the number of nodes the output of one node can be sent to, and we could expect the Info-Brain to attempt to open up these conversations to more listeners. For example, by emails and cellphone-camera videos leaking to the outside world conversations that would once have been kept safely within the iconic “smoke-filled room”. The preceding paragraph might make it sound as if the Info-Brain might be a Force For Good, if you are the sort of person who prefers unfettered free speech and dislikes elitism. However, the Info-Brain is not a Force for Good, nor is it a Force for Evil; it is a Force for Info-Brain. What might we expect the impact to be on privacy? The Info-Brain will tend to erode privacy, making more and more information publicly available, and even discussed. The lack of privacy in the lives of celebrities, has led to enormous amounts of information being passed between nodes. If this were to happen to more people, the Info-Brain would gain more connections, and more signals, between its nodes. The Info-Brain, if it becomes dominant, will erode privacy. Should content be free, or cost money? The Money-Brain certainly wants all movies, music, books, periodicals, or any other type of content to result in a monetary transaction. If charging money reduces the number of instances in which a node accesses content, that is not a problem from the point of view of the Money-Brain. But, from the point of view of the Info-Brain, it is a very grave problem, and it will tend to push things in the direction of more free content. If there are fewer monetary transactions, that is not a problem from the point of view of the Info-Brain. Thus, whether content will be free or cost money is one area where the Money-Brain and the Info-Brain will work at cross-purposes. Should ideas be free, or cost money? The Money-Brain will interpret patents as a good thing, since they cause more transactions to happen. If every idea is patented, for as long a period of time as possible, then there will be more transactions. If large companies do cross-licensing of huge stacks of patents, this causes only one transaction to happen when there could have been many. The Money-Brain will tend to encourage laws and policies which result in more patents, and more payments. Small companies which make only patents, not things, and therefore are unwilling to cross-license, but instead wish to be paid for every patent, are preferable from the point of view of the Money-Brain. Note that it doesn't matter (from the point of view of the Money-Brain) whether the small patent-holding company ever produces anything, or even if they are the first ones to have the idea. What is most important is that there be monetary transactions. Of course, this is only good if the small company then takes that money and spends it on something else in turn, preferably in response to what kinds of patents have been doing best commercially (so that there is feedback, which is how connectionist networks learn). If the small company just took the money and spent it on beer, regardless of what patents did better or worse, this would not be a processing node in a connectionist network (it's taking input, but not weighing it in order to determine where to send the output). But in practice a small company which does better on pharmaceutical patents than semiconductor ones (or vice versa), will change its behavior to concentrate on the field where it sees a better return. 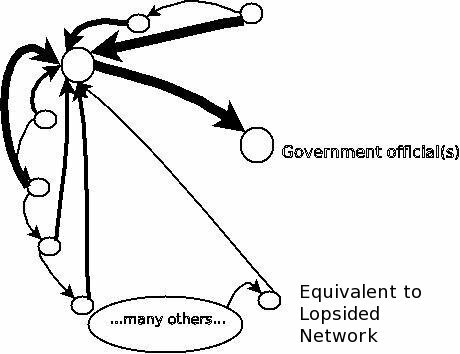 As long as this shows up in its spending patterns (hiring more people with medical backgrounds and fewer with solid state physics, for example), it is a properly functioning connectionist node, taking in input from many sources, weighting them, and sending output in some direction accordingly. The Info-Brain, of course, has a very different impression of patents. For the most part, they act to discourage the exchange of information, at least in the more modern extreme form of patent law. However, a complete lack of a patent system might also be interpreted as damage, since it would cause people who invent things to keep them secret, in order to not lose a competitive advantage. The keeping of secrets (of any kind) is interpreted by the Info-Brain as a malfunctioning (or non-functioning) node. Therefore, we could expect the rise of the Info-Brain to cause the patent system to be weakened, but not eliminated, while the Money-Brain will oppose this, and push for more and more invasive intellectual property laws. Should communication itself be free? The Money-Brain, of course, would want every communications channel to have a cost (e.g. paying for long-distance calls). The Info-Brain would prefer that communication happen as cheaply as possible, and preferably free or at least not in a manner which would have a per-communication charge (e.g. e-mail either free or at a fixed monthly cost). Turning to finance, what would these two networks make of complex derivatives? To the extent that they allow more transactions to be made, the Money-Brain will interpret them as desirable, and act to protect them. The mortgage of a house, for example, is a good thing, because it allows one single transaction (buying a house) to become many (monthly payments). However, these payments are all the same, and all between the same two nodes, and do not vary depending on any input (after the first one, anyway). Repackaging many mortgages, and selling the repackaged result of this (or better yet splitting it up again and selling the parts to different nodes) can allow many more transactions to come out of the original mortgages, and these transactions could create a market of frequent buying and selling, at prices which may vary according to the state of the market at that time. Each additional level of complexity, by allowing another layer of transactions to occur without any additional underlying goods being required, is a positive thing from the point of view of the Money-Brain. The Info-Brain, however, is unimpressed by all this activity. To the extent that it may make it more difficult to determine what the underlying value of things are (i.e. to the extent that it obscures information about house values in a neighborhood, or the true indebtedness or degree of leverage of a business), the Info-Brain may even interpret this as loss of information, and thus as a bad thing. This is another area where the Money-Brain and the Info-Brain may work at cross-purposes. An internet-enable market for used goods, if it causes low-value transactions (for used goods) to replace high-value transactions (for new goods, and for raw materials to make more new goods), could be interpreted as a bad thing by the Money-Brain. From the point of view of the Info-Brain, however, it causes more information to be posted (e.g. about the value of things, and about how people who buy product A are more or less likely to buy product B), and therefore it is good. In these and many other ways, the Money-Brain and the Info-Brain will drive at conflicting objectives. This is not to say that they will always conflict; any phenomenon which causes both more monetary transactions and more sending of information (e.g. advertising) will benefit from the effects of both connectionist networks (even here, though, there may be secondary conflict in what kind of advertising is favored). But in field after field, there are currently two large, connectionist networks attempting to drive the system (i.e. the world) in opposing directions. This means that, roughly speaking, the modern world is schizophrenic. There are two great ordering principles at work, both trying to reorder the world in a manner which will maximize their reach. Neither cares a whit for humans or their environment, and in fact they do not even know about them; what they depend on are nodes, connections, and signals. Like the brain of a growing child which absorbs nutrients and converts them into more neurons, they absorb people and their possessions and ideas, and turn them into nodes in the network. The Money-Brain, being older, is growing more slowly, but we still see it expanding. As for the Info-Brain, although its reach is still less, its growth rate is faster. It seems inevitable that one of them will crowd out the other, or at least subsume it. The question is, which? Which brain has more connections? Which brain has more signals per unit time? Which brain has more nodes? Which brain is more energy efficient? Which brain is able to better prevent a few nodes from dominating the whole network? Why should we care, when it doesn't care about us? Because, whether we know about its existence or not, it will shape the world we live in. Can we do anything about it? Probably not. We can, however, try to prepare ourselves for the world we will find ourselves in. The key to doing that, is to understand what is driving the world, and in what direction. Currently, the answer is that two different networks are driving the world, sometimes in opposite directions. Until one of them or the other achieves clear dominance, we can expect to be in for a turbulent and unpredictable ride.